Purpose: Create multi-year POs/PO contracts using ctcLink. When setting up a contract, you may have the complete information you need to create a contract or you may have only partial information; for example, dates or amounts. You can create a contract with partial information and then fill in any additional information as it becomes available. You need to establish order contracts before you can create purchase orders from a contract. 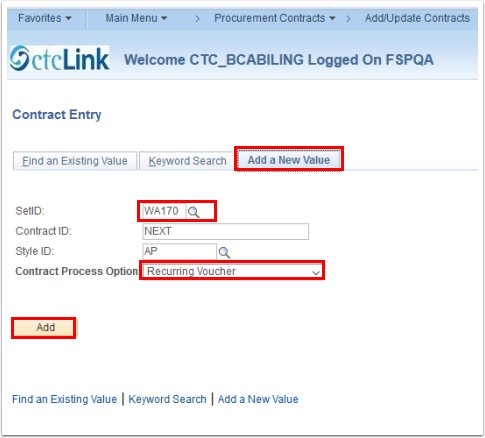 The Contract Entry search page enables you to select a contract process option that you'll use throughout your entire contract life cycle. Contract process options include: Recurring Voucher, Prepaid Voucher, Prepaid Voucher with Advance PO, Recurring PO Voucher, Purchase Order, Release to Single PO Only, and General Contract contracts. Fixed and Open Item contracts apply to Purchase Order and General Contract contracts only. 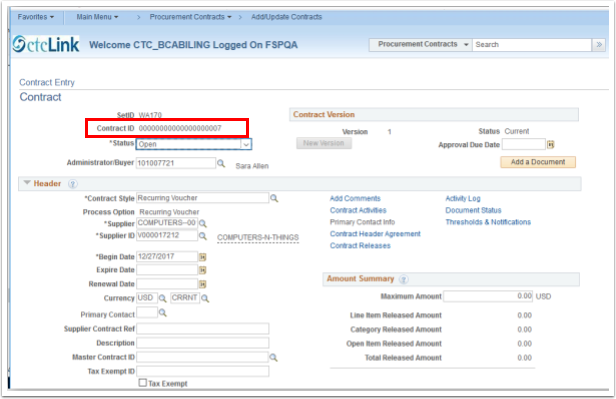 Use a specific contract process option to drive the functionality for the entire contract. Only fields that are relative to the contract process option that you choose appear on the Contract page. Select Add a New Value tab. Enter Set ID. Contract ID will be assigned the NEXT available number once you have completed and saved the form. Select the Contract Process Option menu. Select from the list item. The Contract Version section displays information about the contract version and the version's status. Contract versioning is enabled when the Use Version Control option is selected on the Contract and Vendor Rebate Controls page. You can also define a date for when the contract version approval is needed. 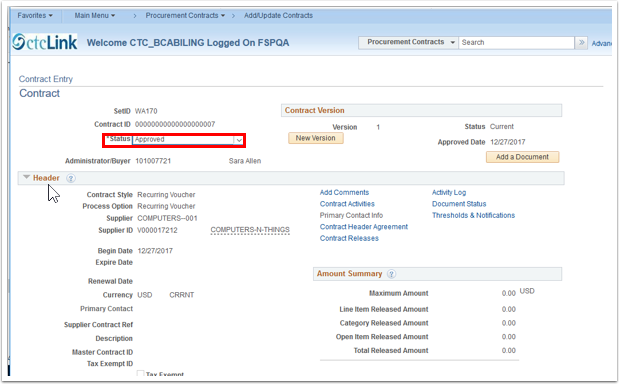 Use the Add a Document button to create an authored contract document using ctcLink Supplier Contract Management functionality. The Status field enables you to select the status of the contract. The valid values are Approved, Canceled, Closed, On-hold, and Open. Only contracts with an Approved status are eligible to have releases assigned against them. Use the Contract page to enter line and item information for the contract. Select the Supplier ID field. Enter the desired information into the Supplier ID field. The Begin Date field displays the current system date as the order contract date. Next, you need to enter the line details for the item. Navigate to the Contract Lines section. Enter the desired Category and UOM field. Select the Order By Amount tab. Select the Merchandise Amt field. Select Amt Only if PO is Amount Only (Blanket). Enter the desired information into the Merchandise Amt field. Enter the Maximum Line Amount. Enter a total amount that this contract should not exceed. Notice that the new Contract ID has been created. Change the Status of Contract to Approved from Open. You have successfully entered an order contract.